Paula is an artist and textile designer residing in Tiverton, RI, with her husband and daughter. She received her BFA in Textile Design/Fibers from UMass Dartmouth and her MFA from Cranbrook Academy of Art in Bloomfield Hills, Michigan. Paula divides her time between creating artwork in her home studio and designing woven and printed fabrics for the decorative home furnishings textile trade. Her art work has been exhibited in group shows & galleries nationally, including; the Fuller Craft Museum, the Imago Gallery, the Narrows, the Attleboro Museum, the Reading Public Museum, the RISD Museum and the Cranbrook Art Museum. Her work is in the collection of the American craft collector Robert L. Pfannebecker, the Cranbrook Art Museum and Saarinen House. Paula’s textile designs have been manufactured by various American and Chinese mills and have been purchased by decorative jobbers; such as, Kravet, Robert Allen and Duralee, as well as Furniture companies, Century, Henredon and many others. In November 2015, Paula was a visiting artist at the Tainan National University of the Arts in Taiwan, where she taught a “Memory and Memorabilia” workshop and had a solo exhibition of her work. She has also taught as an adjunct professor in the textile departments at UMass Dartmouth, RISD and Philadelphia University. I am drawn to textiles, photographs and objects that have a physical and personal history. Over time and through use and wear a fabric or a photograph fades and gradually accumulates the visible evidence of daily life. Many of the photographs and textiles that I use in my work are found objects that I adopt as my own. Who did these objects belong to and what are the memories that each one holds. A lost photograph and a textile fragment offer me a rich beginning for a story, a chance to recreate the memory that was lost. The relationship between the person (or place) in the photograph and the textile represents a portrait or a snapshot of a moment in time. In my life, I have experienced how memory can fade and unravel, leaving behind fragments of vivid detail. My mother suffered from Alzheimer's disease. Gradually, she lost her memory. To help her remember, family and friends sent her photographs and wrote my mother notes about the experiences that they shared together. We compiled the letters and photographs in a book and gave it to my mother for her 75th birthday. My father told us that mom looked at that book everyday. As she read the stories and looked closely at the photographs she was able to reconnect with her memory. In my work, I often unravel the threads of a found textile. For me, unraveling cloth is a meditative, calming process that is a physical metaphor for memory. First, I deconstruct and unravel the textile, then I re-weave the threads, combining them with new threads, merging the old with the new and the past with the present. During the process of re-weaving, the fragile unraveled threads are supported and woven into the vertical warp threads, often resulting in unexpected tension and a new layer of texture. In some of my work I embellish the surface with additional layers of pattern, color and texture with embroidery, applique, beading and stitching. With each process of unraveling, reweaving and embellishing a new generation of pattern and material is combined with the old. The textile embodies the mood and the spirit of the person (s) or place found in the photograph while expressing subtle details, such as; the gesture of friendship and the big sky in “Endearment”, a carefree mood and a subtle breeze in “Zephyr”, cool water and the joy of rowing a boat in “Row”, a gathering of friends on a crisp spring day in “Picnic”, a boy and his toy boat in “Dreaming of the Sea” and the journey towards Heaven in “Heaven Sent”. 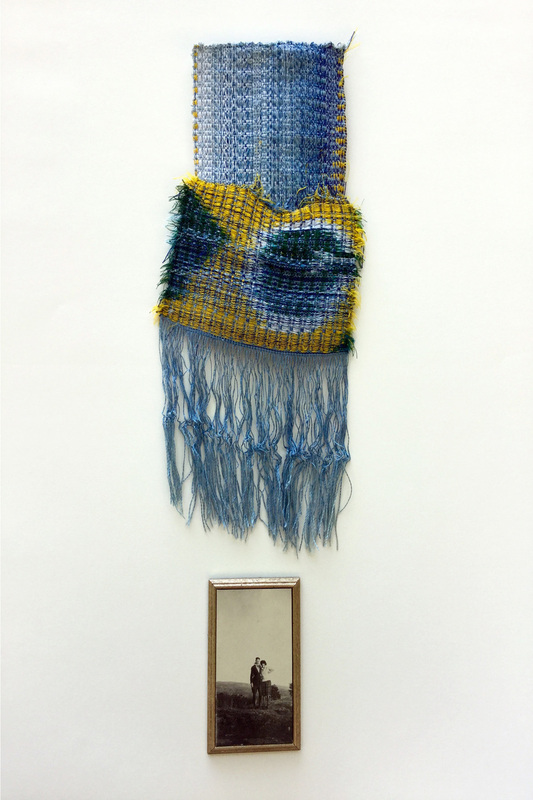 Two or more elements, a textile and a photograph come together to tell a story, to recall a memory and to connect with human experiences.